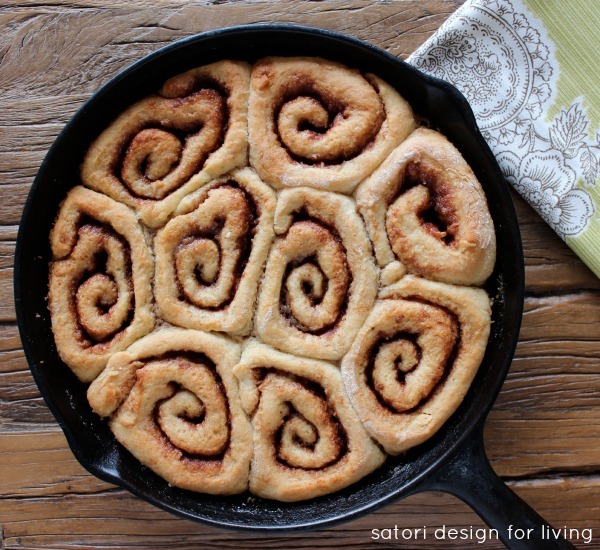 Skillet cinnamon buns with a delicious caramel sauce are simply irresistible! How many times do you pin a project or recipe on Pinterest and actually go back and make it? Over the weekend, I gave myself the challenge to do just that. 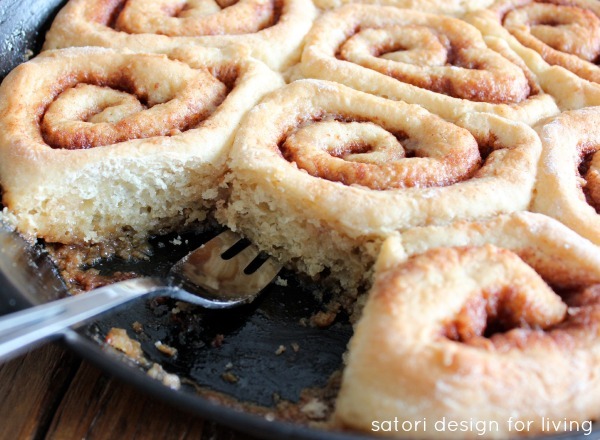 When Crystal from Sew Creative made these Ooey Gooey Caramel Skillet Cinnamon Rolls, I was hooked the minute I saw them. Typically we don’t eat sugary-doughy-desserts around here, but I figured a little indulgence wouldn’t harm us. Besides, the last time I made any sort of cinnamon bun was almost two decades ago (enter husband happy dance)! Crystal at Sew Creative will walk you through how to make this decadent treat on her blog. Before you head over, I must tell you about a few modifications I made for my own preference. First, instead of using canola oil, I substituted coconut oil. As well, I used 2 cups of Robin Hood nutri flour blend “tastes like white” and ¼ cup of whole wheat flour (instead of 2 ¼ of all purpose flour the recipe called for). I’m not a fan of canola oil and I wanted to increase the fiber in these babies (to at least get some health benefits). I can assure you these changes didn’t compromise the taste! They were so delish (even without the icing), and the dough was light and airy. Depending on the size of your skillet, this recipe may make a few extra rolls. I used a 10 inch cast iron skillet which held 9 buns (and had to put the extra dough in a loaf pan). Just make sure you dump a bit of the caramel sauce into the bottom of the loaf pan too. 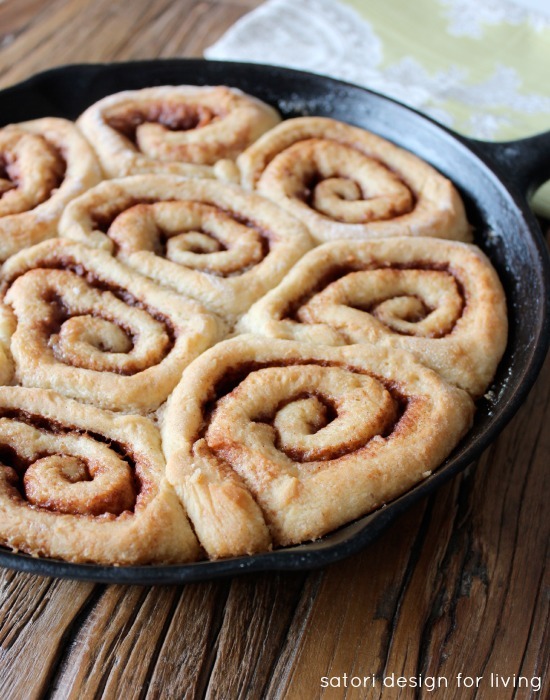 Get the recipe for these yummy skillet cinnamon buns here! Do you have any projects or recipes pinned that you haven’t gotten around to making yet? I challenge you to get going on one this week. Let me know in the comments what you plan on doing! Looking for more delicious recipes? Check out my Yummy board on Pinterest. This looks so good. Never thought to make them in a skillet before. We’re picky and choosy about sweets now, but I couldn’t resist these after seeing them on Crystal’s blog. So worth the splurge! Hello Shauna! I saw her recipe too and thought one day.. one day. I don’t usually make a lot of desserts here either. Yours looks like it turned out great and I bet it tasted oh so good! Love the whole idea of these Shauna, especially your recipe changes! Hubs has this huge cast iron frying pan, so big I have a hard time lifting and cleaning it. I’m thinking it might be the perfect size to give this recipe a go!! Were they crispy on the bottom? Ooey and gooey with a bit of caramelization- just perfect! Those look so amazing! I love that they’re made in a cast iron skillet.